3 Fully flocked, full size Wood Pigeons. These decoys come complete with ground stakes, allowing for a full range of movement-mimicking feeding pigeons. One dozen Sillosock Pigeons contains 8 Feeders and 4 Sentries. These birds are very popular game in Europe but the number of hunters in the United States has grown over the years. 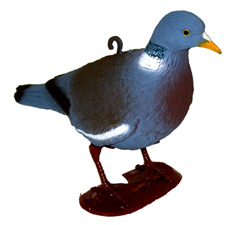 We carry the most complete selection of pigeon decoys in the United States and this is one of our top sellers. This decoy measures 15" from beak to tail and stands 9" tall from the feet. It also has a stake that allows the decoy to move in the wind and it measures 11" tall. This decoy comes in the Upright position only. These decoys make great yard decorations. These birds are very popular game in Europe but the number of hunters in the United States has grown over the years. 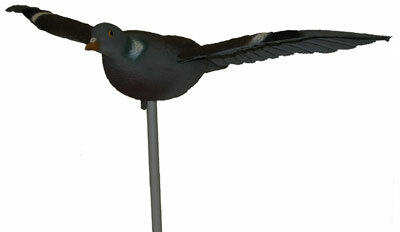 We carry the most complete selection of pigeon decoys in the United States and this is one of our top sellers. This decoy measures 13" from beak to tail and stands 8 1/2" tall from the feet. It also has a stake that allows the decoy to move in the wind and it measures 11" tall. This decoy comes in the Upright position only and is slightly smaller than the #26-00U version. These decoys make great yard decorations. 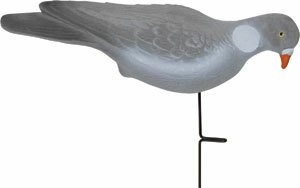 This decoy is one of those decoys that can be used as a decoy or as an decoration in your garden. 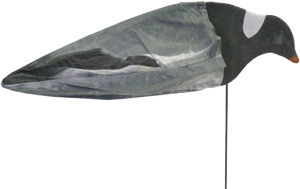 This Sport-Plast decoy has a 25" wing span and can be hung or put on a stake that is included with each decoy. Sold by the each. These birds are very popular in Europe but have a following in the United States. 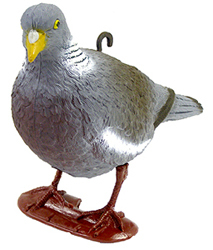 This decoy is the most popular of the Wood Pigeon that we carry. This decoy measures 16". Packaged 12 feeders per dozen.